How does the grant writer fit into the nonprofit organization? A grant writer is generally hired as a temporary freelance consultant when the current staff cannot effectively research, write and complete grant proposals while engaging in their current programmatic responsibilities. We get calls all the time about hiring a grant writer as a regular employee or as a freelance consultant. We built GrantWriterTeam to solve the dilemma for the nonprofit. Most nonprofits cannot afford an additional annual salary with payroll taxes and benefits for a full time grant writer. One nonprofit employee is assigned to the grant writer as the representative and liaison between the three branches of the nonprofit organization. This individual must have a passion for the work of the nonprofit, a clear understanding of the nonprofits operational procedures and access to the nonprofits corporate documents, and the programs and the need for funds, to take on this role. Before attempting to apply for any grant be sure that the organization matches the eligibility requirement, as described in the grant application. What Happens If We Pay The Grant Writer And We Do Not Win The Grant? The grant writer will prepare a well written document that can be easily tweaked or re-purposed and used in other grant applications. What's important is that your nonprofit's boilerplate pieces are well written and represent the history, governance, mission, vision, financial management, operational procedures and policies of the organization. The grant writer should be able to guide the needs statement, programmatic plans, goals, objectives and evaluation and budget for the grant application. One year the Ford Foundation received 144,000 letters of inquiry, e-mail requests, and actual proposals, but were only able to approve under 3,000. By continuously working with the grant writer, the nonprofit leadership or staff member assigned, may get the-hands-on experience and training they need to continue the grant writing process for other similar applications. What Are The Three Branches of the Nonprofit Organization? The Governance – leads the organization by administering the direction and guidance toward achievable goals and successful outcomes. Many decisions are governed by the board and the top tiers of management. The Programs – Programs are the arms and legs of an organization. They take action to provide services, create resources, and strive toward accomplishing the organization's mission within the community. The Central Administration – This includes the ballast of every organization: the office personnel and general staff who perform daily tasks to keep the organization operating smoothly. Board – This group governance serves to represent the organization and its community and clients. The board may also be held accountable for all policies and the strategic direction of its organization. Board Chair – The Chair may appoint and coordinate committees, the executive director, and the board. This is also a position of leadership for the organization. Committees – They carry out the requests and operations of the board. The Executive Director – This position is held responsible on all accounts of the organization, namely, the requests of the board, the committees' and staff's work, and much more. The Staff and Volunteers – These roles are most important in building momentum for the organization within the community to achieve the organization's goals and mission. They generally support the committees and the executive director's requests. 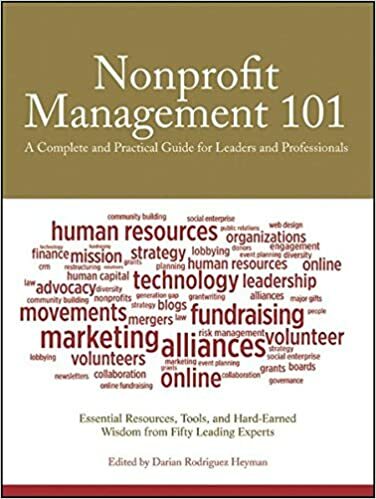 Nonprofit Management 101: A Complete and Practical Guide for Leaders and Professionals, by Darian Rodriguez Heyman.